Saturday, May 21st, 2016, at 7:30 p.m. the Carter Family Fold in Hiltons, Virginia, will present a concert by Vernon McIntyre and Appalachian Grass. Vernon McIntyre’s Appalachian Grass is a driving, five piece bluegrass band established in Cincinnati, Ohio, during the 1960’s. Vernon’s years of playing both banjo and guitar with the greats of bluegrass have honed his skills as an entertainer and make him uniquely qualified to define the traditional bluegrass sound of the Appalachian Grass. The unique sound of Vernon McIntyre's Appalachian Grass draws on Vernon's years of playing with the greats of bluegrass. He began his professional career at the age of 15 playing with Earl Taylor and the Stoney Mountain Boys. He has since played with Walt Hensley, Jimmy Martin, Jim McCall, James Monroe, and Scott Stoneman. Vernon was a founding member of the Bluegrass Pardners of Wheeling Jamboree fame. His banjo work with the Easterners is well remembered. Through the years, Vernon has performed at the Grand Ole Opry, once as a guest of Bill Monroe. He has recorded many projects of his own and has been a guest artist at innumerable recording sessions. 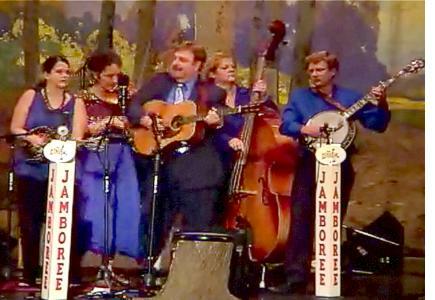 Saturday, December 3rd, 2011, at 7:30 p.m. the Carter Family Fold in Hiltons, Virginia, will present a concert by Vernon McIntyre and Appalachian Grass. Adult admission to the concert is $10, $1 for children 6 to 11, and under age 6 free.